Welcome to our Autoimmunity Blog! The subject of this post is blood tests for the diagnosis of lupus. 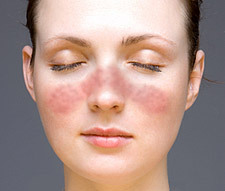 Lupus facial rash in a typical wolf-like distribution. The emphasis of this article is on the detection of autoantibodies relevant to the diagnosis of SLE. Specifically, this includes detection of ANA (antinuclear antibodies) by immunofluorescence and individual tests for various ANA, including anti-dsDNA, anti-Sm, anti-U1RNP (also anti-U1-RNP or anti-RNP), and anti-histone, as well as anti-SS-A/Ro and anti-SS-B/La. Tests for ANA are also highly useful in differential diagnostics, especially when diseases with symptoms resembling SLE must be distinguished from lupus itself, for example fibromyalgia, infections like tuberculosis and HIV/AIDS, or certain malignant tumours, particularly lymphoma and leukaemia. Both of these articles can be downloaded free of charge through these links (as of April 21, 2010). Among the other literature references at the end of this post you will also find a number of open-source and free articles to download. – I hope you find what you are looking for and enjoy a stimulating read! Antinuclear antibodies (ANA) are considered characteristic of inflammatory rheumatic diseases. ANA are antibodies that bind to components of the cell nucleus. These antigens may be localized in the chromatin, nucleolus, nucleoplasm, nuclear matrix, or the nuclear membrane. Common signs and symptoms of systemic lupus erythematosus. Important target antigens of these nuclear antibodies are double-stranded deoxyribonucleic acid (dsDNA), DNA-associated proteins like histones or centromere proteins, and enzymes relevant to cell biology (splicing enzyme, RNA polymerases, DNA topoisomerase I). In a narrower sense, ANA are the autoantibodies that induce nuclear staining in indirect immunofluorescence tests on tissue sections (for example rat livers) or human tumour cell monolayers (such as HEp-2 cells). Today, there is a broad consensus that at least some of these autoantibodies are clearly involved in the pathogenesis of SLE. Elevated values for ANA are detected in the blood of nine out of ten SLE patients. The high diagnostic sensitivity of over 90% for ANA detection makes the ANA test the most sensitive confirmatory test when systemic lupus erythematosus is suspected. However, the high diagnostic sensitivity of ANA detection contrasts with its low specificity in the diagnosis of lupus. In other words, antinuclear antibodies (ANA) are also detected in patients with nearly all other autoimmune diseases, such as systemic scleroderma or polymyositis, as well as relatively often in patients with tumours. Antinuclear antibodies are often detected in some cases of chronic infection, and some healthy patients also occasionally test positive for ANA. Various test methods are used for ANA detection in patient serum, including indirect immunofluorescence microscopy (indirect immunofluorescence technique, IFT; also indirect immunofluorescence assay, IFA) or ELISA technology (enzyme-linked immunosorbant assay). Within the next few weeks, I plan to describe the individual test methods in more detail in another post. Expert opinion states that a positive ANA result should be followed up with assays to detect the individual specific ANAs, depending on the diagnostic question and the immunofluorescence pattern obtained by IFT (IFA). All such patients should be tested for anti-ENA, antibodies against extractable nuclear antigens. Significant for the diagnosis of lupus are anti-Sm, anti-U1RNP (also anti-U1-RNP or anti-RNP), anti-SS-A/Ro, and anti-SS-B/La. The various ENA are associated with different manifestations of the lupus disease. For example, anti-Sm are specific to systemic lupus erythematosus (SLE), and are particularly found in cases of lupus with kidney involvement. On the other hand, anti-Ro antibodies are indicative of secondary Sjögren’s syndrome. Unlike undifferentiated ANA detection, individual detection of antibodies against double-stranded DNA (anti-dsDNA antibodies) and the differentiated detection of anti-nucleosome antibodies are highly specific to systemic lupus erythematosus (SLE). Like anti-Sm antibodies, the anti-dsDNA antibodies indicate involvement of the kidneys in SLE. In addition, the anti-dsDNA titres correlate with disease activity, which makes the anti-dsDNA antibodies a marker for SLE as well as an aide for monitoring the disease. Typically, a flare up of the disease is accompanied by rising anti-dsDNA titres, as well as an increased erythrocyte sedimentation rate (ESR), lowered complement protein values, and reduced lymphocyte count. Usually, the C-reactive protein value (CRP) does not increase with rising disease activity. When this does occur, it could be due to arthritis or serositis. – Warning: an increased CRP value in SLE patients may indicate infection! Immunfluorescence test with Crithidia luciliae: anti-dsDNA antibodies are considered markers for SLE. of suspected systemic lupus erythematosus. Anti-dsDNA antibodies are thus a component of the SLE classification criteria of the ACR (American College of Rheumatology). Literature reports indicate that a positive anti-dsDNA result is indicative of a grave progression of the disease, specifically development of lupus nephritis (kidney lupus). When the disease is active and involves the kidneys, various studies indicate that high titres of anti-dsDNA antibodies are usually detectable. Within this clinical framework, experts believe that anti-dsDNA antibodies are very valuable for monitoring disease. Increasing levels of antibodies can thus be used to predict oncoming flare-ups. – Warning: The absence of anti-dsDNA antibodies does not rule out SLE! To my knowledge, there are basically three tests in use for the detection of anti-dsDNA antibodies at present: the ELISA (enzyme-linked immunosorbant assay), the immunofluorescence test or immunofluoreszence assay (IFT resp. IFA) with Crithidia luciliae cells(crithidia luciliae immunofluorescence technique, CLIFT), and the Farr assay with radiolabeled double-stranded DNA. Antibodies against the Sm antigen (anti-Smith antibodies, anti-Sm antibodies), a ribonucleoprotein from the cell nucleus, are almost exclusively found in patients with lupus. The diagnostic specificity is high at 99%. In contrast, anti-Sm antibodies are rarely found in patients who suffer from other rheumatic diseases; they occur in less than 1% of healthy individuals. Anti-Sm antibodies thus have a marker function in lupus diagnostics, and are an ACR criterion for the diagnosis of SLE (ACR = American College of Rheumatology). The diagnostic sensitivity of anti-Sm antibodies, on the other hand, is slight: only about 20% of people with lupus have anti-Sm antibodies. I find it noteworthy that the occurrence of this biomarker can vary significantly within individual ethnic groups. I have thus found that the incidence of anti-Sm antibodies in SLE patients of Asian or African descent lies between 30 and 40%, whereas for lupus patients of Caucasian ancestry it is significantly lower, at 10 to 15%. As to the question of whether the appearance of anti-Sm antibodies correlates with disease activity, and flare-ups in particular, I have found contradictory claims. This still appears to be a bit unclear. Claims of correlation with specific manifestations of the disease are also partially contradictory, although severe organ manifestations, such as involvement of the central nervous system or kidneys, seem to go hand-in-hand with the appearance of anti-Sm antibodies. In contrast to the anti-dsDNA antibodies, the anti-Sm antibodies do not correlate with the degree of kidney involvement in lupus nephritis. On this point the literature is in agreement. In general, anti-U1RNP antibodies (also known as anti-RNP antibodies) are found together with anti-Sm antibodies in the serum of SLE patients. The incidence of anti-U1RNP antibodies in people with lupus is 25%, while less than 1% of healthy individuals have these antibodies. IFT with HEp-2 cells: anti-RNP antibodies show a spreckled pattern. Unlike anti-dsDNA and anti-Sm antibodies, anti-U1RNP antibodies are not specific for lupus. They also occur in other rheumatic diseases, including rheumatoid arthritis (RA), systemic sclerosis, Sjögren’s syndrome, and polymyositis. It has been demonstrated that anti-U1RNP antibodies are detectable in patients with scleroderma, including Raynaud’s phenomenon. There is also a connection to other diseases, such as Jaccoud’s arthropathy. The titre of anti-U1RNP in an individual may vary. However, I have found no literature reference indicating a correlation between the level of anti-RNP antibodies and disease activity. There thus seems to be no relationship. Anti-Ro/SS-A and anti-La/SS-B antibodies are mainly found in people with systemic lupus (30 to 40%) or primary Sjögren’s syndrome (for Sjögren’s syndrome, anti-Ro/SS-A are diagnostic markers and an ACR classification criterion). Anti-Ro and anti-La antibodies can also be detected in a number of other rheumatic diseases, such as systemic sclerosis, rheumatoid arthritis (RA), and polymyositis. According to the literature, these autoantibodies are also found in over 15% of healthy individuals. Anti-Ro and anti-La are thus not specific for diagnosing lupus. However, as has been described a number of times, they are connected to a number of specific symptoms typical of lupus, such as extreme sensitivity to sunlight, or subacute cutaneous lupus erythematosus (SCLE). They are also linked to a deficiency in certain complement factors. In addition, the children of mothers whose serum contains anti-Ro and anti-La antibodies have an increased risk of developing neonatal lupus erythematosus (NLE), a disease that can lead to congenital heart block (CHB). I found it recommended that SLE patients wishing to have children should always be tested for anti-Ro/SS-A and anti-La/SS-B antibodies. Antibodies against histone, known as anti-histone or AHA, are detectable in patients with a variety of diseases, primarily rheumatic conditions. Among specialists in this field, there is consensus that they are not in themselves sufficiently specific for the diagnosis of lupus. High titres of anti-histone antibodies are almost exclusively detectable in patients with systemic lupus erythematosus (SLE) and drug-induced lupus (DIL). This means that in the absence of SLE marker antibodies, a high-titre of anti-histone antibodies can be considered characteristic of drug-induced lupus. That’s about it for autoantibody detection in SLE diagnosis. If you would like to know more about the individual antibody tests or individual antibodies and my literature references do not suffice, please refer to our list of literature references about ANA at the ORGENTEC website, which I will update in the next few days. Earlier in this post I touched briefly on the laboratory tests for the detection of C-reactive protein (CRP) and erythrocyte sedimentation rate (ESR). I would thus like to briefly mention the detection of the complement proteins and the significance these laboratory tests may have for confirming a lupus diagnosis. If the overall level of complement proteins is low, an infection may be indicated. If the clinical picture otherwise indicates it, a low level of complement proteins is also supportive of a lupus diagnosis, according to rheumatologists. If the values of complement proteins C3 and C4 are low and the ANA result is positive, an active phase of disease may be indicated, possibly with kidney involvement. Thanks for visiting my blog, and thanks for leaving a comment on this post. Please do not seek personal medical advice via the Internet. Every disease is individual and especially autoimmune disorders can occur with various symptoms that should be carefully examined by a specialist medical doctor in a face to face consultation. I am a biologist, not a medical doctor. If you are suffering from an autoimmune disease or you think you might be (and I suppose, you do so! ), seek medical attention, preferably by a specialized rheumatologist, and rely on your doctor’s advice. Fiona, all the best to you! Why no anti-ribosomal-P test is mentioned in your “Blood Tests for the Diagnosis of Lupus”? Is this test not specific or sensitive enough to detects SLE autoantibodies? Yes, Jason, you’re dead right! Thanks for this interesting piece of remark. Certainly, detection of rib-P antibodies is of great importance in the diagnosis of systemic lupus erythematosus. Anti-Rib-P are considered highly specific autoantibodies for SLE. They especially have been reported in patients with central nervous system involvement, so called lupus psychosis. The reported frequency of antibodies to ribosomal P protein in SLE patients is approximately 20%. Rib-P antibodies are very rarely found in cases of other autoimmune diseases, and they are undetectable in cases of infection. The concentration of Rib-P antibodies correlates well with the status of the diseases (they are detected predominantly during the active states of the disease). In particular, anti-ribosomal-P antibodies are specific to neuropsychiatric SLE. Those neuropsychiatric manifestations are common in 40 to 90% of all patients suffering from SLE. Though Rib-P antibodies detection actually is consistent with the diagnosis of systemic lupus erythematosus, most SLE patients do NOT have detectable levels of antibodies to ribosomal P protein! Thank you for this valuable remark. In a healthy person, ANA-antigens are located inside the cells, they are not exposed to the circulation and therefore they are “invisible” for antibodies and immune cells. In contrast, lupus patients show immunological abnormalities: Their regulation of T- and B-lymphocytes is out of balance, they have a defective clearance of autoantigens and immune complexes, and they produce pathogenic autoantibodies. These antibodies can be detected in serum samples by their characteristic binding pattern to nuclear structures in HEp-2 cells cultured on glass slides. All test components, especially buffers and conjugate are adjusted to the cell preparation used in a test kit (e.g. Anti-Nuclear Antibodies HEp-2 (ANA-HEp-2) from ORGENTEC Diagnostika). By preparation and fixation of the cells on the slides, and incubation with adapted reagents, intracellular antigens become accessible for the autoantibodies in the serum sample. Hi a couple of years ago I had 2 positive high ANA tests, the primary Dr. asked me how I was treating my Lupus, I said I didn’t know I had it. Since then with different dr.’s and the addition of 90mg’s of Duluxetine daily, I have not tested positive for ANA but have tested positive for RNP AG IGG with the range of >1.1 and mine was 6.5…and this particular ruehmatologist told me that he sees nothing in my blood that would point to Lupus. This doesn’t seem right. Meanwhile I can’t work without extreme pain and flare ups on face and hands, joints, etc. and don’t know where to turn. I can understand that you are looking for help with the severe health problems you are suffering from, and I feel with you. But first of all, I want to emphasize, that you should NOT quest for personal medical advice via the internet. Every disease is individual, and under different circumstances, similar symptoms may have different causes. Especially inflammatory rheumatic diseases are challenging to diagnose and to treat. I strongly recommend that you discuss your concerns with a rheumatologist of your confidence. He or she will give you advice while taking into account all aspects of the clinical picture. If you need further help you should contact a local representative of a patient organization, like arthritis foundation (www.arthritis.org) in the US or one of the EULAR PARE organizations (https://www.eular.org/myUploadData/files/PARE_directory_web.pdf) in Europe. They provide a variety of services for patients, e.g. self-help groups, physiotherapy, social programs, psychological assistance, information, events with specialists, telephone help lines, self-management promotion, etc.